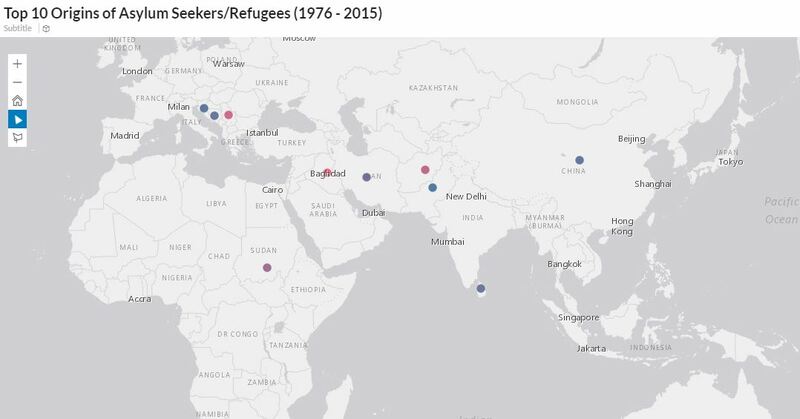 This blog reflects our journey in producing data visualization using SAP BusinessObjects Cloud (BOBJ Cloud) to tell the story of refugees in Australia. Paul Hawking, SAP Mentor and our Lecturer in Business Analytics, challenged us with this assignment, and here is our process blog. Refugees, a huge topic, where to start? We researched the topic ‘Refugees in Australia’ and found several articles regarding the boat people. As refugees come to Australia by air and by sea we chose to concentrate on the ones coming by sea as their journey seemed more critical and more dangerous. We read several articles that described the influx of boats, deaths at sea, and political views. 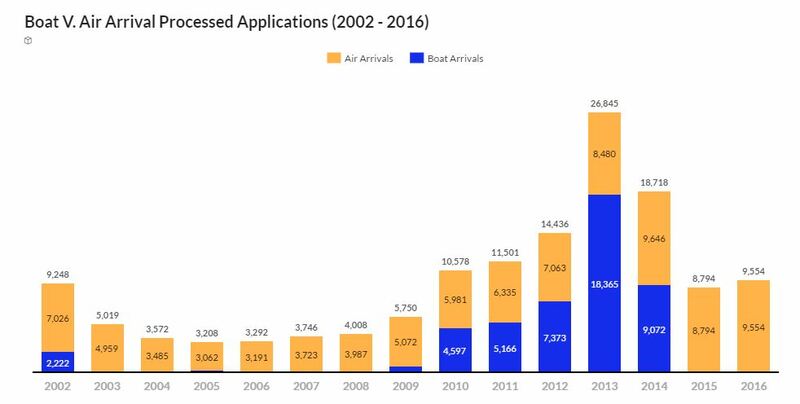 It was obvious that there were dramatic changes to the amount of boat people arriving in Australia, so we were interested in knowing what triggered this to happen? Data lead us to believe that political policies and wars were the main contributors. As we only had 6 minutes to present our findings we decided to concentrate on boat people and the political policies around it. Many hours were spent finding data, matching data in databases to news articles, expanding on data -as some databases only had a small range of years and we needed to find the other years elsewhere- and then verifying the data. Nearly all data was verified by three different data sources. We decided to start our story from 1976 for many reasons; one being the term ‘boat people’ came in 1976 when the influx of Vietnamese came to Australia as a consequence of the Vietnamese war aftermath and wars throughout the world. Another deciding factor was to look at government policies affecting the arrivals of boat people. We needed a large data set as governments can reign for a long period and we wanted to look at both governments over several stints in power. For example during this time John Howard was Liberal Prime Minister for 11 years, Malcom Fraser 8 years and Labour had a 13 year stint with Hawke and Keating. We wanted to see if it was government policy that predicts the boat people arrivals. Data visualisation can be used for both explanation and exploration; this assignment enabled us to experience both of these aspects. The explanation perspective was practised by exploring statistics and data available on “boat people” then create different visualisations to highlight different aspects within the data. After building those visualizations, we moved to exploring the data and identifying the trends. The work was structured using the data visualisation workflow; prepare the data, visualise the data, compose the data into a story, and then share the story. We wanted to emphasise the best practices we learned in our Business Analytics class by choosing the appropriate graph type, introducing clear titles, labels, be aware of the data ink v. non-data ink ratio and using convenient colours. Also we followed the advised approach of showing an overview first, zoom and filter, then details on demand. Building a database can be easy if you know in advance what sort of information you want to present and what sort of visualization you need to produce. However, this is normally not the case; building a very simple database can be beneficial for generating a simple single-purpose visualization, nevertheless, if later on you decided to alter your story, explore the data set from a different angle or even filter and drill-down to slice and dice the data you need to have a large comprehensive database that can be manipulated into a flexible model in BOBJ Cloud. We also learned that once your model is ready, it is a good idea to invest some time setting up the preferences of your visualization to guarantee unification all through your slides. Although this might consume sometime in the beginning, it will pay off later on as all the produced graphs will be automatically identically formatted. Moreover, presenting graphs is meaningless if not supported with good scenario that explains what has happened, why it happened, what is happening now and open the door for future anticipation. 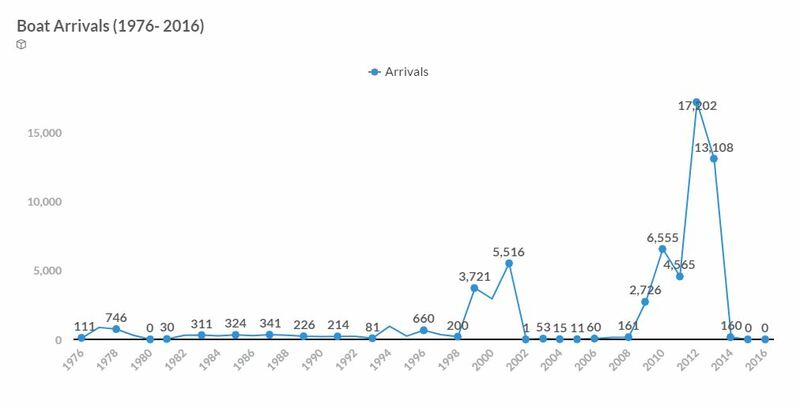 Visualization 1 describes the arrivals of boat people from 1976 to 2016. Stretching the value axis took so much time as we could not figure out how to do this, after searching google, watching YouTube tutorials, asking other class mates and our tutor; we were told it cannot be done. We were not happy with this as we felt our low level quantity data was not represented accurately visually. 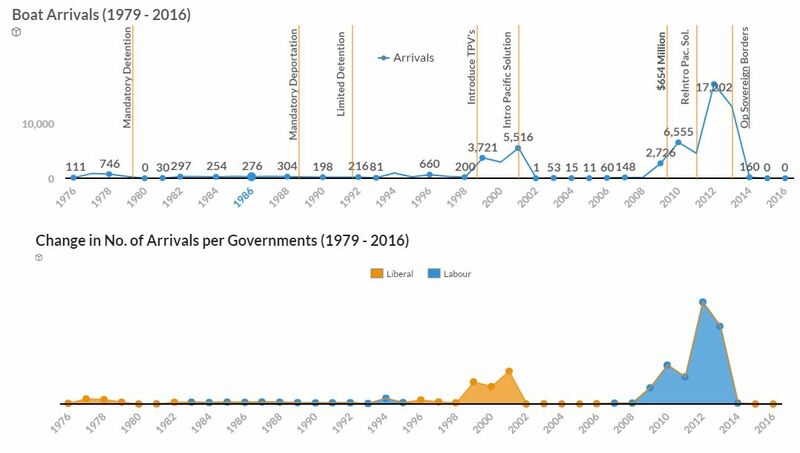 To try to understand the effects of the influx and reduction of boat arrivals over the years, we researched the changes in government and analysed all the policy changes to boat people, refugee and asylum seeker laws from 1976 to today. There were hundreds of policy changes during these years and we read them all to decipher which ones affected the boat people, directly. We then needed to pick out the major policies to fit in the 6 minutes frame. Visualization 3 describes the boat people arrivals from 1976 to 2016 as per visualization 1 with an overlay of the boat people policies, implemented by the Government in power. The second visualization shows what government was in power during this period. 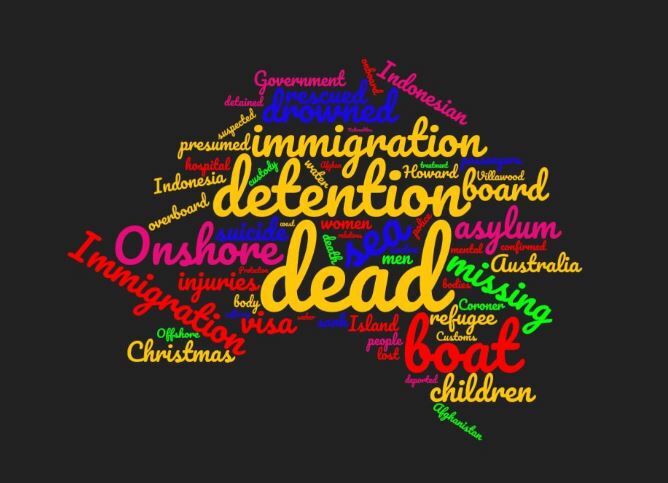 We looked at all deaths related to refugees/asylum seekers in custody and then compared how many were related to boat people. As all this information was in unstructured text, it took a long time to turn it into structured text and then into database, cleanse it and finally upload it to BOBJ Cloud. Reading about children and pregnant women dying was very emotional and made our stomachs turn to the point we could only work on this in small chunks as it was too over whelming. Visualization 4 shows the number of deaths of boat people at sea, by gender, where known. Visualisation 5 shows the percentage of deaths at sea compared to other types of deaths of asylum seekers/refugees in custody. The first trial recording went for over 24 minutes and our story needed cutting back – a lot. So we had to figure out what was important and what message we were trying to convey. Whist a lot of information had to be let go we concentrated on delivering the key points with the most impact. We had several catch ups to talk about where we were at and how to move forward and we also got together to pull it all together and work on graphs and the overall presentation and the recording and editing in Windows 10 Xbox screen recorder. The journey was hard, long and challenging but we have learned a lot about refugees, how humans can be heartless and also learned a lot about generating visualizations and creating a story. Overall this was a great learning curve in regards to finding and verifying data, BOBJ Cloud was at time frustrating as it is very limited and we wanted to be so much more creative.